Bronchitis is an inflammation of the mucous membranes of the bronchi, medium-sized and large airways in the lungs. Bronchitis results in restriction of air flow to the lungs. Bronchitis is different from both brochiolitis, which is inflammation of the small airways that lack mucus-secreting glands and cartilage, and from bronchiectasis, which is the permanent dilation and destruction of bronchi involving chronic cough (Breslow 2002). While sometimes the definition of bronchitis is extended to include inflammation of the air passages between the nose and the lungs, including the trachea (windpipe) and the bronchi (Longe 2006; Krapp and Wilson 2005), technically the term refers to inflammation of the bronchi. 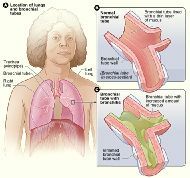 Trachiobronchitis is the term commonly used when there is inflammation of the trachea together with inflammation of the bronchi (Breslow 2002). Bronchial asthma is an inflammatory disease but is not classified as bronchitis. There are two main types of bronchitis in humans: Acute and chronic. Acute bronchitis is of brief duration and is one of the more common illnesses impacting preschool and school-age children (Krapp and Wilson 2005). Chronic bronchitis involves a long course and may be a sign of serious, underlying lung disease that may be slowed, but not cured; it is a major cause of disability and disease (Longe 2005, 2006; Krapp and Wilson, 2005). Personal responsibility is key to prevention and treatment. The best preventative measure to not begin smoking or to immediately stop smoking, with other preventative steps including avoiding chemical and environmental irritants and maintaining good health (Longe 2006). Chronic bronchitis is by far most commonly caused by cigarette smoke. When acute or chronic bronchitis is diagnosed, a key treatment step for smokers is to stop smoking. Bronchus (plural bronchi, adjective bronchial) is a caliber of airway in the respiratory tract that conducts air into the lungs. No gas exchange takes place in this part of the lungs. The vertebrate trachea (windpipe) divides into two main bronchi (also mainstem bronchi), the left and the right, at the level of the sternal angle. The right main bronchus is wider, shorter, and more vertical than the left main bronchus. 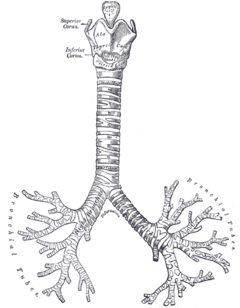 The right main bronchus subdivides into three segmental bronchi while the left main bronchus divides into two. Bronchitis is an inflammation of the bronchi. Inflammation is a localized protective response of a body's living tissue to injury, infection, irritation, or allergy. Inflammation is characterized by the following quintet: Redness (rubor), heat (calor), swelling (tumor), pain (dolor), and dysfunction of the organs involved (functio laesa). Inflammation is part of the innate immune system, that is, the immediate "first-line" of defense to illness or pathogens. Inflammation is not a synonym for infection. Even in cases when it is caused by infection, it is incorrect to use the terms as synonyms: Infection is caused by an outside agent, while inflammation is the body's response. Acute bronchitis usually involves an infection, typically caused by viruses, such as influenza, the common cold viruses (rhinovirus and coronavirus), and so forth (Breslow 2002). However, it can also be caused by bacterial infection or there may be secondary bacterial infection (Longe 2006). Nonviral agents include Mycoplasma pneumniae, Chlamydia pneumoniae, and Brodetella pertussis (Breslow 2002). It can also be caused by inhalation of various foreign materials (toxic gases, products of combustion, etc.) (Breslow 2002). Acute bronchitis may last several days or weeks. Acute bronchitis is most common among infants, young children, and the elderly (Longe 2006). Children under the age of five are more commonly diagnosed with bronchitis than any other age group (Krapp and Wilson 2005). Other at risk categories include smokers, people with lung or heart diseases, and individuals exposed to chemical fumes or high levels of air pollution (Longe 2006). As with any inflammation of the upper airway, acute bronchitis can increase the likelihood of a person developing pneumonia. Acute bronchitis is characterized by cough and sputum (phlegm) production and symptoms related to inflamed airways and the phlegm (causing obstruction), such as shortness of breath and wheezing. There may occasionally be chest pains, fever, and fatigue or malaise. Usually, acute bronchitis begins with symptoms similar to a cold, such as a runny nose, sneezing, and a dry cough, but soon the cough becomes deep and painful (Longe 2006). The phlegm or sputum may be greenish or yellow, and fever may reach 38.8 degrees centigrade or 102 degrees Fahrenheit (Longe 2006). Diagnosis of acute bronchitis is by clinical examination, including observing the patient's symptoms and health history, and sometimes microbiological examination of the phlegm. A physical examination will often reveal decreased intensity of breath sounds, wheeze (rhonchi), and prolonged expiration. A stethoscope may be used to listen for sounds specific for lung inflammation, such as moist rales, crackling, and wheezing (Longe 2006). Most doctors rely on the presence of a persistent dry or wet cough as evidence of bronchitis. A sputum sample showing neutrophil granulocytes (inflammatory white blood cells) and culture showing pathogenic microorganisms such as Streptococcus spp. Damage caused by irritation of the airways leads to inflammation and leads to neutrophils being present. A sputum sample may be collected by asking the patient to cough deeply and spit the material that comes up from the lungs or it can be collected by bronchoscopy, using a local anesthetic and passing a tube into the airways (Longe 2005). A sputum culture may be performed if the sputum is green or has blood in it to identify the disease-causing organism (Longe 2005). Acute bronchitis needs to be distinguished from an attack of [[pneumonia] (where chest x-rays will reveal a shadow, or lung infiltrate lacking in acute bronchitis), bronchial asthma, and acute exacerbation of chronic obstructive pulmonary disease (COPD) (Longe 2005). In the absence of a secondary infection, acute bronchitis may be treated the same as the treatment for a common cold, including rest and drinking plenty of fluids, and perhaps acetaminophen for fever and pain (Longe 2005). Cough suppressants are employed only when the cough is dry and without production of sputum (Longe 2005). When phlegm is being coughed up, it should be allowed to continue to bring up the extra mucus and irritants from the lungs, thus reducing the plugging of airways by the accumulating mucus and also reducing a breeding ground for bacteria (Longe 2005). Expectorant cough medicines can be used to thin the mucus, making it easier to cough up (Longe 2005). Treatment may be with antibiotics (if a bacterial infection is suspected), bronchodilators (to relieve breathlessness), and other treatments. In most cases, acute bronchitis is caused by viruses, not bacteria, and it will go away on its own without antibiotics. To treat acute bronchitis that appears to be caused by a bacterial infection, or as a precaution, antibiotics may be given (Sethi 2003). If antibiotics are used, a meta-analysis found that "amoxicillin/clavulanic acid, macrolides, second-generation or third-generation cephalosporins, and quinolones" may be more effective (Dimopoulos 2007). To help the bronchial tree heal faster and not make bronchitis worse, smokers should completely quit smoking (AAFP 2006). Alternative treatments focus on prevention by emphasizing a healthy diet to strengthen the immune system and practicing stress management (Longe 2005). Various herbal medicines may be used to treat bronchitis, such as inhaling eucalyptus or other essential oils in warm steam (Longe 2005). Overall, acute bronchitis usually lasts approximately 20 to 30 days. It may accompany or closely follow a cold or the flu, or may occur on its own. Bronchitis usually begins with a dry cough, including waking the sufferer at night. After a few days, it progresses to a wetter or productive cough, which may be accompanied by fever, fatigue, and headache. If the acute bronchitis is uncomplicated, the fever, fatigue, malaise, and other symptoms, except the cough, may last only a few days (Longe 2005). The wet cough may last up to several weeks. Should the cough last longer than a month, some doctors may issue a referral to an otolaryngologist (ear, nose, and throat doctor) to see if a condition other than bronchitis is causing the irritation. It is possible that having irritated bronchial tubes for as long as a few months may inspire asthmatic conditions in some patients. In addition, if one starts coughing mucus tinged with blood, one should see a doctor. In rare cases, doctors may conduct tests to see if the cause is a serious condition such as tuberculosis or lung cancer. Chronic bronchitis involves chronic or recurrent excess bronchial mucus secretion (Breslow 2002). It is defined clinically as a persistent cough that produces sputum (phlegm), for at least three months in two consecutive years. It is found almost exclusively in adult smokers (Krapp and Wilson 2005). The death, morbidity, and economic impact of this condition is immense, as is emphysema (Breslow 2002). Chronic bronchitis is not generally caused by infection; the most common cause is inhalation of respiratory tract irritants, with the most common irritant being cigarette smoke (Longe 2006). Other irritants include air pollution and chemical fumes, as well as mold, dust, and other environmental irritants (Longe 2006). Chronic bronchitis is generally part of a syndrome or group of diseases called chronic obstructive pulmonary disease (COPD), a category that also includes emphysema and chronic asthmatic bronchitis, the latter generally not included as bronchitis. Chronic bronchitis may proceed to, or be concurrent with, emphysema (Longe 2006). Chronic bronchitis develops slowly over time, with the irritants paralyzing or snapping off the cilia of the cells that line the respiratory tract and normally move the mucus along (Longe 2006). 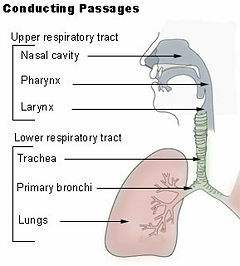 The airways become clogged, inflamed, and narrowed, and this leads to difficulty breathing (Longe 2006). There are two types of chronic bronchitis, both linked to cigarette smoking: "Simple chronic bronchitis" and "chronic obstructive bronchitis." Patients with simple chronic bronchitis lack airflow obstruction on pulmonary function tests or spirometry, while those with chronic obstructive bronchitis exhibit reduced air-flow rates (Breslow 2002). Some patients with simple chronic bronchitis progress to chronic obstructive form of bronchitis, and most of these also have emphysema (Breslow 2002). Usually the first visible sign of chronic bronchitis is a mild cough, commonly called "smokers' cough" (Longe 2006). Patients with chronic, obstructive bronchitis typically have a daily cough, shortness of breath, sputum production, and sometimes wheezing (Breslow 2002). Chronic respiratory failure may occur in advanced cases (Breslow 2002). There may be acute exacerbations one or two times a year when there are episodes of increased cough with shortness of breath, discolored sputum, and wheezing. Mucosal hypersecretion is promoted by a substance released by neutrophils. Further obstruction to the airways is caused by more goblet cells in the small airways. This is typical of chronic bronchitis. In diagnosing chronic bronchitis, a key method is the pulmonary function test, which used a spirometer to measure the volume of air entering the lungs and leaving (Longe 2006). A physician may do further examinations using a chest x-ray, electrocardiogram, and blood tests (Longe 2006). There is no cure for chronic bronchitis, although the progression may be slowed and an initial improvement in symptoms may be achieved (Longe 2006). Treatment is complex, and medical management usually involves such measures as lifestyle changes, such as quitting smoking and avoiding polluted air and secondhand smoke, improved nutrition, exercise, and immunization against infection by influenza virus and Streptococcus pneumoniae (Breslow 2002; Longe 2006). Treatment with bronchodilator drugs (such as albuterol) are used to relax the muscles of the bronchial tubes and allowed increased air flow (Breslow 2002; Longe 2006). Other strategies include providing supplemental oxygen and anti-inflammatory medications. American Academy of Family Physicians (AAFP). 2006. Acute bronchitis. Family Doctor. Retrieved March 20, 2007. Dimopoulos, G., I. I. Siempos, I. P. Korbila, K. G. Manta, and M. E. Falagas. 2007. Comparison of first-line with second-line antibiotics for acute exacerbations of chronic bronchitis: A metaanalysis of randomized controlled trials. Chest 132(2): 447-455. Krapp, K. M. and J. Wilson. 2005. The Gale Encyclopedia of Children's Health: Infancy Through Adolescence. Detroit: Thomson Gale. ISBN 0787692417. Sethi, Sanjay. 2003. Bronchitis. The Merck Manual of Medical Information. Retrieved June 27, 2016. This page was last modified on 27 June 2016, at 23:07.